Edwards Lifesciences has a heritage of partnering with clinicians to bring advancements in patient care to the market. That heritage is at the core of the Acumen Hypotension Prediction Index software. Developed in partnership with clinicians across the world and the first in a new category of products, Acumen Hypotension Prediction Index software offers the only predictive monitoring parameter for hypotension that is available in Europe. This first-of-its-kind predictive decision support software detects the likelihood of a hypotensive event before it occurs. Additionally HPI provides insights into the root causes of the event and helps you identify the best potential course of action for your patient. As part of the Acumen decision support suite, the Acumen Hypotension Prediction Index software is unlocked with the Acumen IQ sensor. The proprietary algorithm — developed using data from almost 59,000 hypotensive events and over 144,000 non-hypotensive events — coupled with machine learning techniques, potentially detects hypotension even before it occurs. 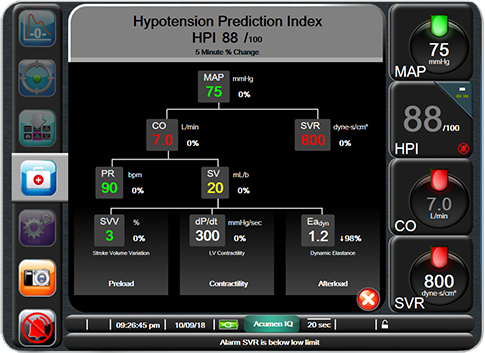 The HPI parameter value is updated every 20 seconds, providing continual predictive insights into developing hypotensive events. The full table of Results of Clinical Validation studies may be found in Table 12-6 in the Operator's Manual. The HPI Alert warns you when your patient is trending toward or experiencing a hypotensive event. The Alert pops-up when the HPI parameter exceeds 85 for two consecutive 20-second updates or reaches 100 in any particular update. 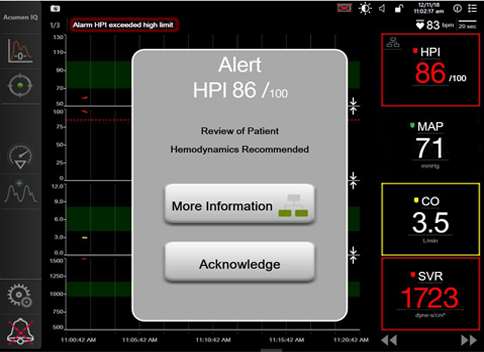 The Alert popup window will appear, prompting you to review the patient's hemodynamics using the HPI secondary screen. If your patient is trending toward a hypotensive event, or is experiencing one, you may want to investigate the root cause in order to proactively inform a potential course of action. The advanced hemodynamic pressure and flow parameters on the HPI secondary screen provides information to investigate and identify the root causes of developing hypotensive events. 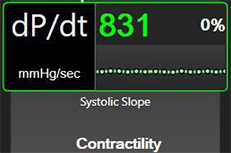 The HPI secondary screen is accessed through the HPI high alert popup, by touching the HPI Information Bar (when enabled), by pressing the button on the HPI Key Parameter, or at any other time through the Clinical Actions menu on the monitor. The HPI secondary screen displays consolidated values for the patient's clinical parameters of MAP, CO, SVR, PR, SV, and SVV as well as two additional indicators of contractility and afterload to provide a complete hemodynamic profile of the patient. 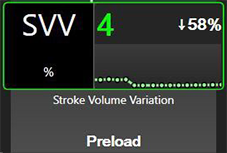 The advanced hemodynamic parameters on the secondary screen are arranged visually by preload, contractility, and afterload. 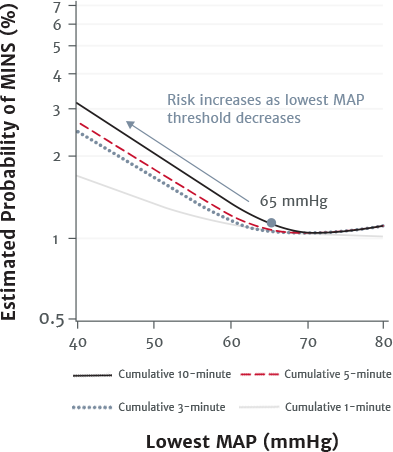 These advanced hemodynamic parameters provides you potential insights into the cause of a hypotensive event. 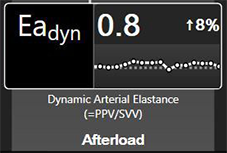 Acumen Hypotension Prediction Index software is the first predictive technology that provides you with information regarding the likelihood of a patient trending toward a hypotensive event* and assists you in understanding the root cause of deteriorating hemodynamic stability. The Acumen IQ sensor — part of the Acumen family of hemodynamic sensors — unlocks the Hypotension Prediction Index software. The minimally-invasive Acumen IQ sensor connects to a radial arterial line. 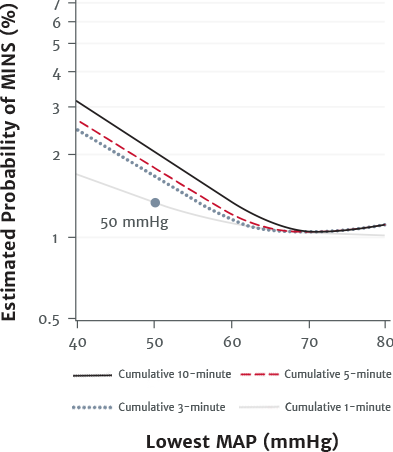 The Acumen IQ system automatically updates advanced parameters every 20 seconds, reflecting rapid physiological changes in moderate-to high-risk surgery. 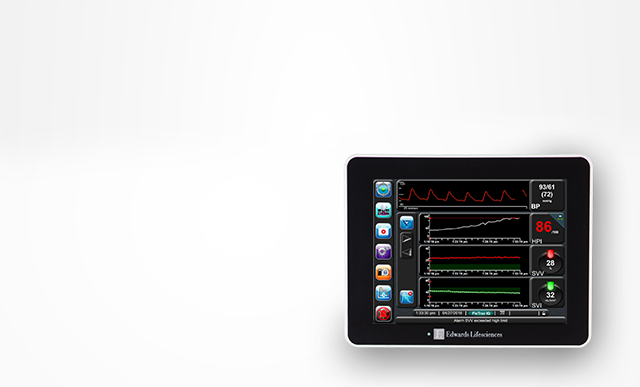 Advanced hemodynamic parameters provided by the Acumen IQ sensor offer you continuous insight into your patient’s hemodynamic status.